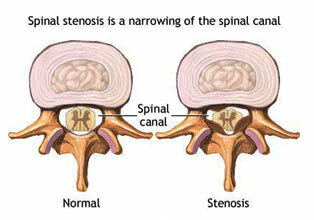 You can think of spinal stenosis as "angina of the spine". In spinal stenosis, the spinal canal becomes narrowed to the point that the micro-circulation to the spinal cord and spinal nerves are compromised. This causes a variety of symptoms including back pain, sciatic nerve pain, numbness, weakness, balance problems, a flexed forward posture, difficulty walking any distances, and/or any combinations of these. In severe cases, muscle atrophy along with bowel and bladder disturbances may develop. Spinal stenosis is also called the great masquerader since it can mimic several other conditions such as peripheral vascular disease, neuropathy, large joint problems, or central nervous system disorders.